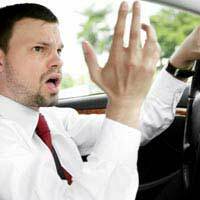 Home > Anger - The Basics > What is Road Rage? Hostile behaviour, that includes anger, frustration, heightened violent emotion and deliberate acts of endangerment to others, forms the basis of what is commonly known as road rage. During the past decade this form of extreme behaviour has increased so greatly that it is now accepted as a mental disorder. Understanding what triggers this pattern of behaviour, however, may help drivers deal with aggressive tendencies in a more acceptable manner. Driving can be a stressful activity if not managed in a beneficially correct way. As an experienced driver you learn to deal with the driving errors other people make and develop coping mechanisms that enable you to stay safe whilst on the road. Some drivers, however, may be more defensive or anxious than others, and an uncontrolled, explosive action, and reaction, may therefore be triggered more easily. Escalation of angry and aggressive behaviour is a concern when driving, as road rage can quickly develop into a situation that is out of control. Whilst an aggressive driver may shout expletives at a driver who makes driving errors or cuts off vehicles at an intersection, without taking the time to calm down the internal anger outrage will continue to fester and grow until road rage becomes the only means of venting the feelings of frustration. Taking regular breaks whilst driving long distances, or after experiencing an incident that has affected personal calm and increased anger and frustration, is important in curbing and controlling aggression and limiting road rage. Without a pause to calm thinking and feelings erratic behaviour, anger and frustration overrides normal good judgment, which may result in explosive reaction. Learning some defensive driving techniques, which help to reduce the severity of minor accidents and incidents on the road, will help drivers understand the importance of not getting behind the wheel of a vehicle if experiencing a highly emotional state of feeling. Recognising your own personal anger levels will also enable you to assess situations, on the road, as they arise and with better judgment. In some extreme cases road rage has lead to vehicular homicide, assault and/or other forms of physical personal attack. A simple recognition of fault, or driving error, from the other driver can be all that is required to diffuse the explosion of road rage. When this is not presented a driver can quickly become more aggressive and less focused on maintaining road safety, and consequently may act out of character by driving in a less considered manner. Road rage can be expressed as a short-span event and so a driver may not fully realise, and/or accept, their extreme behaviour in the moment. They may also not show any signs of this aggression and emotional impairment once the road rage incident takes place. In order to combat possible explosions of road rage it is worth taking a few steps to make positive changes in your driving habits. Ensuring you are well rested before embarking on a long journey, eating well and maintaining good breathing practice will also help reduce stress on the road for yourself, and other drivers. Listening to calming music, allowing yourself sufficient travelling time to reach your destination and slowing down will also help you become a more empathic driver.